In order to generate leads with inbound marketing, it is crucial that you create content for people who are in different stages of the buyer journey. 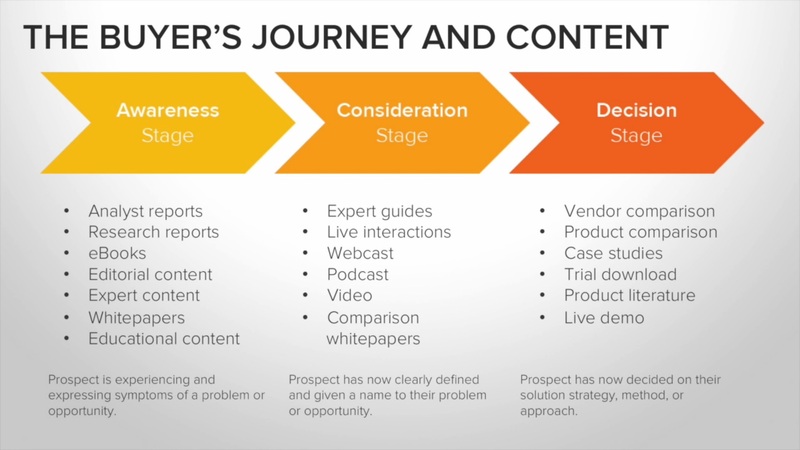 HubSpot’s methodology divides the buyer’s journey into three stages, first is the inbound marketing awareness stage content, consideration stage content, and decision stage content. The awareness stage is the first stage of the buyer’s journey when someone has just realized that they have a problem or need for a product. The key to success for when you create awareness stage content is a combination of understanding your buyer persona and knowing the different stages of the buyer’s journey. Remember, inbound marketing is different than traditional methods because it focuses on drawing people in rather than interrupting them with your message. Inbound marketing is driven by having good content. The best strategy for creating content to reach people in the awareness stage is to focus on buyer’s pain points. Pain points are the problems that people are experiencing and they are looking for answers. Almost all products or services solve a problems or fulfill a need that people have. By identifying these pain points, you will gain insight into the things these people are feeling and researching. People in the awareness stage are experiencing the pain points that your product will solve. When they look for solutions, you want them to find your products. The key in this stage is to focus your content on educating people and not on talking about your product. In the awareness stage, people are not ready to make a buying decision, so if you give them a sales pitch they won’t be interested. Your content should be focused on educating people on what their problem is. This will draw all those researchers into your website and show them that you understand their pain points. Some types of content that work at this stage are blog posts, videos, eBooks, or research reports. Just make sure to keep it educational and position yourself as the expert. Companies that just talk about themselves are only marketing to people who are in the decision stage of the buyer’s journey and are missing out on reaching everyone else. Once you have created the content you want to make sure that it is easy to find. During the awareness stage, potential buyers begin to do research online to figure out what their need or problem is. Most research is done online, in fact, 72% of buyers turn to Google for their research according to Pardot.com. This is why having strong social publishing and SEO strategies is so important. SEO strategies help you to understand what keywords people typing into search engines like Google, when they are doing research. Having a good understanding of your buyer persona will help you to know where to promote your content. For example, since a large number people use their mobile phones to do research, having a mobile responsive website is also beneficial for SEO and will make you content easier to read on mobile devices. The planning to create awarness stage content is just part of an inbound marketing campaign. Ideally, you will want to create content for all stages of the buyer’s journey. That way, no matter what stage someone is at there will be content directed at them. The awareness stage is often the one that businesses are most interested in because it is the beginning of generating new leads. An inbound marketing agency will use content to draw people in, educate people, and nurture leads into customers.